Windsong Pavilion, Four Winds Tathra Bermagui Road, Barragga Bay , NSW, Australia. The Griffyn Ensemble, "Canberra's premier chamber ensemble" (CityNews), are bringing their latest groundbreaking multi-media show The Dirty Red Digger to regional New South Wales in June 2015. The Griffyns offer up a unique perspective on the First World War, by combining such unlikely bedfellows as music, football, history and social politics. The Dirty Red Digger is a potent and cohesive narrative told through music, spoken text and film that highlights the social pressures and challenges that faced Australians both then and now. At the core of the show is a well-researched and richly illustrated history of rugby league - the 'game of the people' that has carried its devotees through dark times and golden eras. Insightful archival film and images of the war era (from the National Film and Sound Archive, British Film Institute and the National Library of Australia), are presented alongside recent interviews, to compare the camaraderie of the young Australian men a century ago with the team spirit, instincts and loyalties of young men who play for the Gungahlin Bulls Rugby League Team today. The show explores the conscription debate, the opposing ethical positions of organised sport during wartime, depression in returned soldiers and young rugby league players today, cultural icon Les Darcy, and the role and importance of music as propaganda, social commentary, and in uniting people. 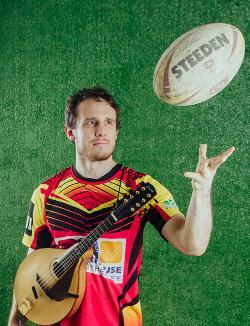 The Griffyn Ensemble's artistic director, composer and mandolinist Michael Sollis, is also passionate about footy and has played first grade with the Gungahlin Bulls since he was 16. Team Griffyn are all highly regarded and accomplished musicians and features the vocal talents of soprano Susan Ellis, double bassist Holly Downes, harpist Laura Tanata, violinist Chris Stone, and flautist Kiri Sollis. Their theatrical, accessible and audacious approach to contemporary music has excited audiences since 2005, earning them a loyal following in Canberra. The Dirty Red Digger is their most ambitious project to date and premiered on ANZAC Day 2015 in Canberra. The show has received critical praise and glowing reviews, and has also been toured extensively as part of Musica Viva in Schools education program.